The Durian fruit is one of the smelliest fruits in the world and a lot of people don’t like eating it. 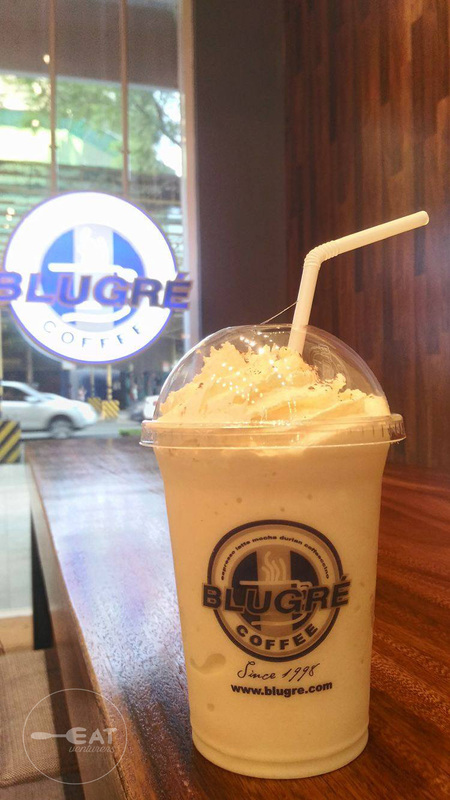 Blugré Coffee wants to introduce Durian to non-Durian eaters through their hot and cold drinks. Their vision is to bring Davao to the world. We learned that they are branching out in Metro Manila. For now though, we will be reviewing its Bonifacio Global City (BGC) branch. You have lots of options to choose from. Beat the heat with their Durian and Cream or have your caffeine fix with their Durian Coffeeccino (hot) and Durian Arctic Blast (cold). All are priced P160 for Tall and P175 for Grande. 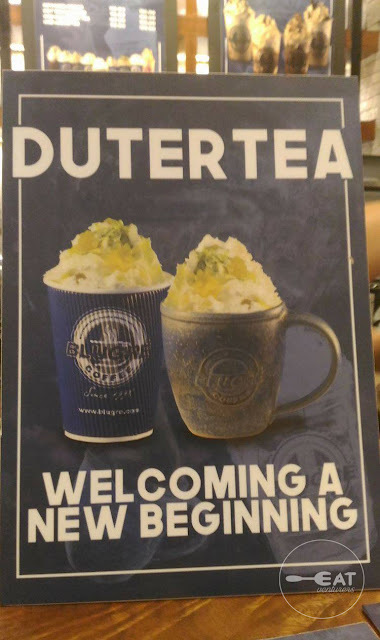 You may also try Durian Bar for dessert with their witty-named tea, “Dutertea” (P160 for Tall, P175 for Grande) served hot or cold and made of durian and matcha green tea. It is a play on President Rodrigo Duterte’s name, who also hail from Davao City. The Eatventurers have only tried their Durian and Cream drink. If you hate the taste or smell of Durian and is not into caffeine but you like Davao's durian candies and Thailand's durian chips, Blugré Coffee’s Durian and Cream (P160 for Tall and P175 for Grande) is recommended for you. It is one of their cold drinks made with durian and cream (well, obviously) with chocolate toppings which gave some depth in flavor. Do not worry, Durian Cream’s aroma is not that strong and its taste is like that of a candy – a little bit sweet. Caution: Like any other drink, and like your regular durian, it is best if you finish it immediately. If you don't, it will get bitter. It is a bit disappointing though because we didn't notice any note saying you need to pay service charge when you dine-in. Price of dine-in costs 195 pesos. Still affordable for BGC-pricing. Aside from Durian-infused drinks and desserts, the cafe also offers regular coffees, sandwiches, pastas, pastries, paninis, and cakes like your regular coffee shops. Service was okay. 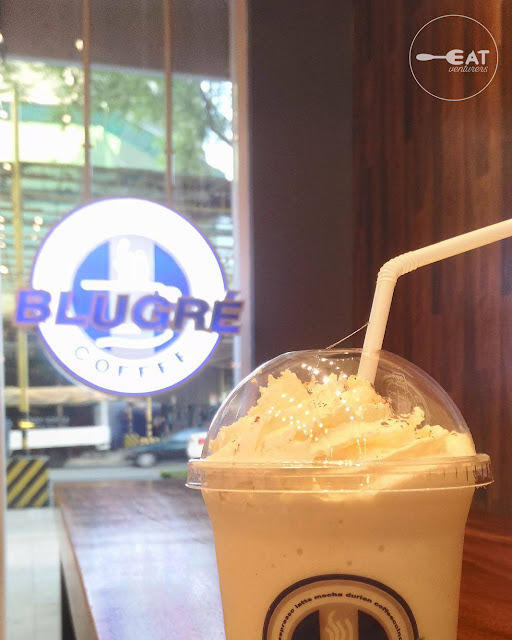 Selling point – Blugré Coffee has ultra-fast wifi! A word of caution though, the place is relatively small and the place isn't too comfy. You will have to share your table with others and the sockets are a little bit far. But hey, emphasis on ultra-fast wifi! Operating hours: 6:00 a.m. - 10:00 p.m.